Image credit: Ronald Edwards, Telling stories on Gunai country, 2016, acrylic on canvas. Collection of the artist. 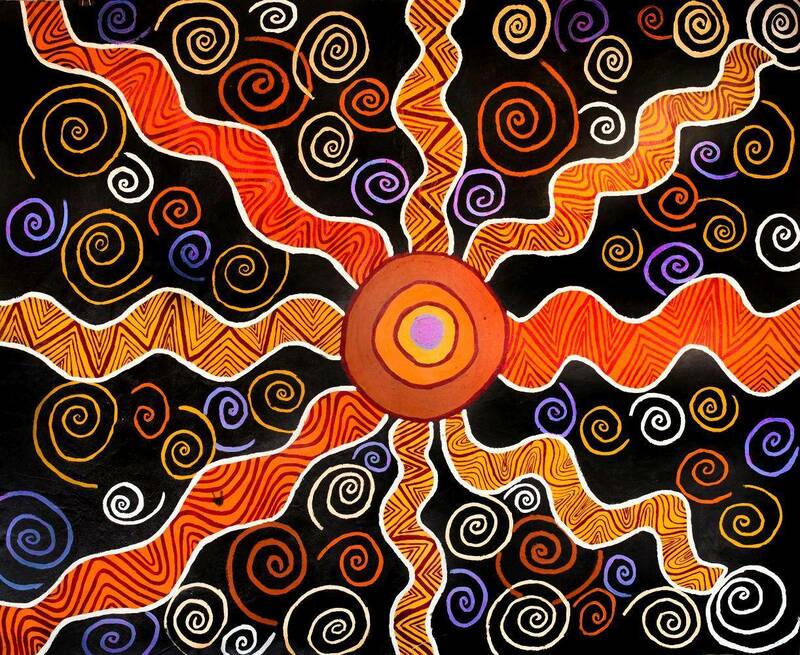 Sounds of Country includes works by indigenous artists who currently live in Gippsland: Uncle Dennis Seymour, Aunty Gloria Whalan, Aunty Eileen Harrison, Irene Ridgeway, Lisa Kennedy, Patrice Muthaymiles Mahoney, Mick Harding, Ronald Edwards, Rob Bundle and Gina Bundle. The exhibition explores the Indigenous concept of Deep Listening to Country, revealing the profound sense of connection the artists have to the land and to the natural world. The concept of Deep Listening appears in many Aboriginal languages. In the Yorta Yorta language of the Murray River in Victoria, it is ‘Gulpa Ngawal’ and in the Taungwurrung language of central Victoria, it is ‘Gunggi – Wagabil Yu-a’. In the Gunnai/Kurnai language of Gippsland, it is ‘Molla Wariga’. Deep Listening goes well beyond what we can hear with our ears. Those who engage with the artworks in the exhibition are invited to explore inner and outer worlds through image, story, song, language and the silence that lies between. The artists in Sounds of Country present different perspectives and shown together, reveal a network of connections. Working across a range of mediums, the artists have created works that resonate with sonic energy, connecting people to Country and the Country to people.